With touch-screen ease, embedded EFI® SendMe™ technology in the CX3641 MFP lets users quickly convert paper documents to digital files, edit them in a variety of ways, and share, distribute or store them on- or off-site—right from the MFP. SendMe saves time. When a document is scanned, its image appears on the full-color LCD screen, so users don’t have to return to their PCs to see the results. The intuitive interface makes it simple to remove borders, change the angle, and select specific sections to cut and paste or simply erase. The one-stop workflow also means that users can focus on the task through its completion, reducing the types of distractions that can introduce errors and diminish productivity. Scans can be saved in industry-standard digital file formats (PDF, JPEG and TIFF); with the optional OCR (optical character recognition) software, files can be saved as editable and searchable PDFs or Microsoft® Word documents—enabling users to search scanned documents for words, extract text, and perform document indexing. Users can choose the optimum file size to provide the fastest transmission and best document quality. SendMe works with all leading network infrastructures, including LDAP, Microsoft® Active Directory, Microsoft Exchange® and Lotus® Notes®. And because the user is never separated from the document, the workflow cannot be broken, averting potential security issues. SendMe saves money. With embedded SendMe software in the CX3641 MFP, there’s no need to purchase additional PC software to complete the conversion or editing processes. SendMe is also designated for unlimited users—everyone in the department or workgroup can enjoy SendMe’s advantages without additional costly software licenses. And the technology is so intuitive, so easy to use that minimal training is required to get the best possible results. Print from virtually any business software application and get great results— even with large files— through Smart RIP technology. Get consistent color page to page and job to job. Produce graphic arts-quality documents with ease. Save the time and cost of using internal repro centers or outside print vendors. Command WorkStation™: automatically identifies and displays information about Fiery servers on the network; enables operators and administrators to track and manage jobs, and oversee job flow. Virtual Printers: allows users to select from among preset, locked-down configurations and automatically apply custom properties to their print jobs— including color matching, media selection/mixing, even finishing options. EFI ColorWise™: provides accurate color across platforms, applications and all types of media. It enables maximum control over color quality with a suite of advanced and precise tools and personalized settings. EFI SpotOn™: used to create or edit spot color tables or define custom spot colors (e.g. “Corporate Red”); ensures that the CX3641 MFP will reproduce unique mixtures accurately from job to job. EFI HotFolder™: provides the user with a simple and automated method for sending print files to the Fiery controller; eliminates the repetitive tasks and possibility of user error in configuring settings for multiple jobs. The convenience and cost-savings of the CX3641 MFP can also be harnessed from the desktop—over the network and the Web—with additional standard software supplied by OKI Printing Solutions. PaperPort® 10 SE: this document management application is designed to save busy users time and money by transforming hard-copy documents into searchable digital documents. It converts paper forms into electronic forms and combines word-processing and spreadsheet files into single, universal .pdf documents with drag-and-drop simplicity. OmniPage® 14 SE: an OCR application designed specifically for network environments, it offers the highest level of accuracy and format retention, and cuts proofreading to a minimum. An ideal solution for converting and re-purposing paper documents and PDF files for editing and archiving. Networking Utility and Print Tracking from OKI Printing Solutions PrintSuperVision: Internet-based software components that enable administrators to access and distribute printer data and control printer functionality. Job Accounting (Server and Client) Software: enables tracking of color printing costs and easy monitoring and control of printer usage. Not only can the CX3641 MFP print and copy faster than most of its competitors, with High Definition Color print technology and 1200 x 1200 dpi print resolution, there is no compromise on output quality. 1. Multi-level LED printheads: systematically control the amount of toner applied to each dot—increasing the color intensity. Multilevel LED printheads can achieve 256 levels of intensity, so that crisp image detail is preserved and color fidelity is maximized. 3. Single Pass Color™ technology: in this process, the paper medium follows a streamlined path, passing beneath four in-line printheads—one each for cyan, magenta, yellow and black (CMYK)—through the fuser, and out to the user. Simple, effective and fast. With the CX3641 MFP, you can output reams of reports and high-impact presentations with color graphics; brochures on up to 170-lb. index (307 gsm); mailers on waterproof, tear-resistant sheets; transparencies; even attentiongrabbing banners up to 12.9" by 47.24". Use standard off-the-shelf media or select your stock from the tested—and proven—media collection available through your Authorized OKI Printing Solutions MFP Dealer. Control the ways in which the CX3641 MFP is used— and take control of the bottom line. Protect files from hackers through 128-bit encryption on SendMe files. Prevent unsecured connections to servers through IP filtering and port blocking features. Link access restrictions to the company’s e-mail directory (LDAP), and require user password authentication. Limit e-mail from the MFP, with requests granted or denied based on entering of valid network passwords. Control access privileges—such as ability to print/copy in color—through assigned Personal Identification Numbers (PINs) and LDAP user authentication. Even with all of the color-centric benefits included in the CX3641 MFP, users need not pay more if they have black & white print and/or copy requirements. With a low monochrome cost per copy, the CX3641 MFP is an ideal upgrade for existing monochrome MFPs. 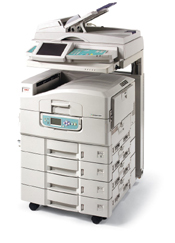 You can expect total support from your Authorized OKI Printing Solutions MFP Dealer.